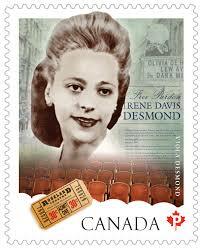 Born on July 6, 1914 in Halifax, Nova Scotia, African Canadian Viola Desmond was raised in a large family with 10 siblings. Viola’s father was a barber. Following a similar path, Viola opened her own successful beauty school and launched a line of beauty products. By all accounts Viola was a successful and respected businesswoman. Her business, Vi’s Studio of Beauty Culture in Halifax, helped prepare young black women for employment as beauticians. Viola’s story doesn’t have much to do with her successful career, however. Instead, it centres around what should have been a pleasant evening out. On November 8, 1946, Viola’s car broke down in New Glasgow. Knowing nothing could be done about it until the following day, Viola decided to take in a show at the Roseland Theatre, where she bought a ticket on the main floor. When she went to take her seat, the ticket taker challenged her, claiming she had a ticket for the balcony. Viola assumed a mistake had been made so she returned to the ticket seller, who told her, “I’m sorry but I’m not permitted to sell downstairs tickets to you people.” That’s when Viola realized that the theatre was discriminating against her based on the colour of her skin. She refused to accept this, and walked right back into the main floor of the theatre and took a seat. Viola was then approached by the manager. When he couldn’t rouse her from her seat, he summoned a police officer who dragged her out of the theatre, injuring her knee and her hip, and took her to jail, where she remained for the night. The next morning Viola went to court where she was charged with evading a one-cent amusement tax (despite having paid for a main floor ticket). For this she was fined twenty-six dollars. She decided to fight the charge but ultimately lost. Her lawyer did not take the legal fees owed to him, and instead went to support the newly established Nova Scotia Association for the Advancement of Coloured People (NSAACP). Viola has since appeared on a Canadian stamp, had a Halifax ferry and a Montreal street named after her, and in 2018 she became the first non-royal woman to be featured on a Canadian banknote (a ten-dollar bill).